For those who don’t know, we have two delightful Isa Brown chickens called Doris and Daphne. We got Daphne first and she’s top hen. She’s also a little older than Doris and her eggs are bigger. I find having two different sized eggs comes in very handy, especially when breaking down recipes into different quantities. The best conversion for 1/3 of 2 normal eggs is 1 mini egg because you can’t really divide an egg can you? My taller half is, well, taller so he has two big eggs for breakfast and I have two small eggs. It works. The point of this story is that we get a lot of eggs. Two a day, most days of the year and you only have to NOT eat eggs for a a few days (generally speaking, five) and all of a sudden you have a big pile of eggs in the fridge and getting bigger by the day. I hate waste so these eggs must be put to use. If I don’t get time to make something fabulous with then I take half a dozen into work and run what I call ‘eggslotto’. The first person to email me back wins the eggs. It’s become quite competitive. 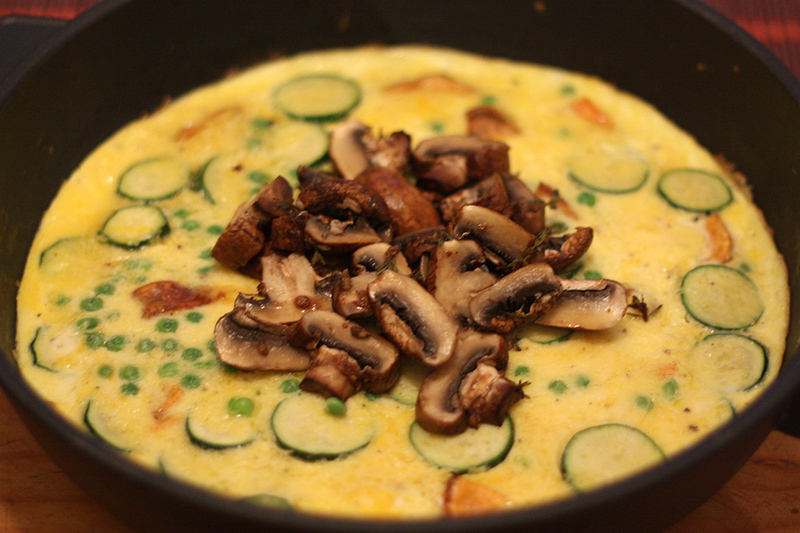 One great way to get rid of a bunch of eggs in one hit is to make frittata. I use about 8 eggs (half big and half small) to make enough for the two of us which puts a substantial dent in the egg pile. 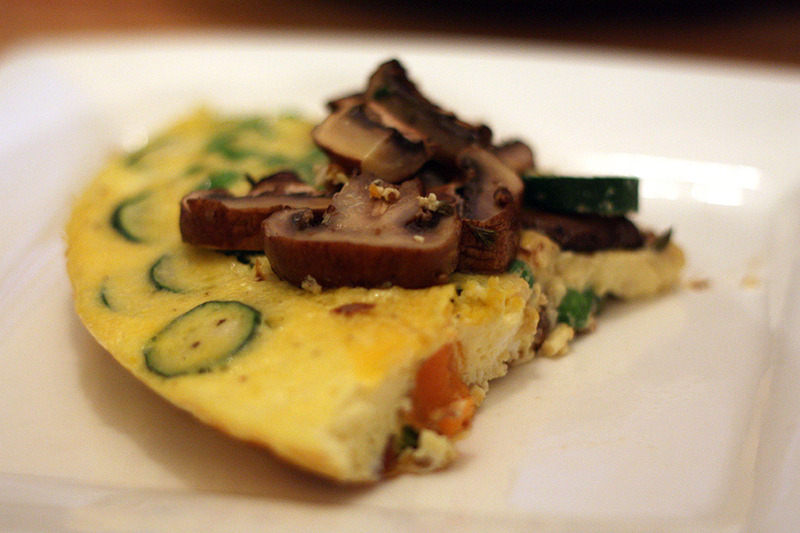 This particular frittata recipe is vegetarian and easy. Roast sweet potato in oven for about 20 minutes on abut 180ºC or until just done. Mix eggs, milk, salt and pepper in a bowl. Distribute sweet potato, zucchini and peas evenly in a deep heavy based pan then pour over egg mixture. Cook covered over medium – medium/low heat until done. Meanwhile put mushrooms in a plastic bag with the olive oil, crushed garlic, thyme and balsamic and shake until mushrooms are all covered in marinade. Put in the oven and roast for about 20 minutes on 180ºC or until mushrooms are just done. Remove from oven, slice and serve on top of frittata. Tip: Sliced mushrooms are a yummy and integral part of many meals but, wherever possible, I find the best way to get the best flavour from mushrooms is to cook them whole. Slicing them causes them to lose some of their liquid and thus, flavour. Cook first, slice later, that’s my mushroom motto.